Why is the Fuel Eonomy so poor? An extended warrenty is seldom worth the paper it's written on. There are usually many restrictions and hoops to jump though in the event it is needed. Miatas' in particular are very reliable and should run for many happy miles with minimal attention (that is, oil changes as recommended, brake flush every couple of years, coolent change as recommended. Don't waste your money. As far as milage, remember it is a sports car, not a Prius. I have never gotten more than high 20's in any of my Miatas. Remember to enjoy the drive, they are wonderful little cars. To expand a bit on apustac's comment; the reason for the Miata's gas mileage is that it has relatively low torque, and in order to produce good acceleration the gear ratios are set for performance rather than economy. While it may look to many like a "little economy car", it is in fact a sports car and Mazda made no attempt to maximize fuel economy at the expense of performance. Like apustac, I don't know of any Miata that gets more than the high 20s in MPG (average). My two (1992 and 1995) average 28 consistently in mixed driving. If yours is getting less than that, and you are not in constant stop and go driving then I'd say maybe your oxygen sensor died and the car is running rich. Otherwise it's normal; put the top down, followed by your foot, and have fun. I bought my MX-5 in April 2008 and sold it this spring. I never had any repairs so for me an extended warranty would have been a waste of money. My car was an automatic. Driven at not too much over legal speeds I have gotten as much as 31 mpg with top up. Top down would not be as good. 28 was more normal. I always used high test, not regular gas. Alcohol-free gives better mileage. I agree with the above posts. I have a 2008 MX-5 PRHT and have had zero troubles with it. It is a solid car and I would certainly not buy any extra warranty for it. Just as others have pointed out, extended warranties are nothing but gimmicks designed to bilk money out of people. Just maintain the car with regular oil changes, brake flushes and other routine maintenance procedures. I get about 28 mpg on average too. Yes, other modern 2.0 liter engine cars can give up to 35 to 40 mpg average. But, you'll in no way have the fun you get when driving a Miata. To create the wonderful sporty feel of the car, Mazda engineers have not tried to optimize fuel economy, but rather the total power output at different throttle settings. 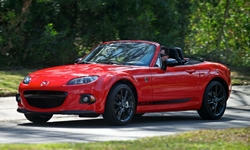 I have had 4 miata's so far - all have been very reliable and no trouble. Two have had over 125,000 miles. One is a mega monster miata so that one doesn't count towards mileage. The ones I have had are older (newest 2001) and I consitently get above 28 mpg and sometimes in the middle 30's. I live in the Colorado mountains so would expect better mileage at a lower altitude. Maybe the older ones were lighter or gear ratio's different but I had decent mpg. As I write this we are in the middle of a large snow storm but surprisingly the Miata is good until we get about 6", then the air dams become plows. "I live in the Colorado mountains so would expect better mileage at a lower altitude." Actually, at higher altitude there is less oxygen for the engine to breath (in non turbocharged cars). In order to not run too rich, the engine computer will dial back the fuel. The result is lower power, and better fuel economy (just like lifting your foot). I agree with the others. But when not driving for fun, you can hypermile and drive for economy. I do them both, the economy is when I tour cross country typically 1000mi trips and fun is usually short and fast slalom style which gets the worst mpg. Average is 33 mpg in summer, 30 mpg in winter, link shows 40 tank fills graph. Note the newer ND MX5 gets over 38 mpg average. Just wanted to weigh in with MPG for the newest ND (2016-) model with the 2.0L engine. Just at 7,000 miles since I purchased in August 2015, it's strictly a summer car for me. I use an app to record fuel mileage and it's showing me a consistent 30.8mpg. The new "SkyActiv" engines and transmissions are really well geared for enthusiastic diving through the mountains, country roads, etc. ... revving the engines up and keeping between 3,000 - 5,000 RPMs keeps the torque flowing... and apparently without much penalty on the fuel economy. 2013 PRHT Club. The car seems geared for autocross. 70 on the highway it's turning over 3200 rpm so the mileage suffers. But if I wanted a highway cruiser...would I really have thought "Miata - yeah that's the ticket" :). Mid to high twenties for mileage is my norm. I use 91 octane. As far as a warranty - I have had absolutely nothing go wrong with the car. OK the dome light bulb burned out, you got me. It's living up to its troublefree reputation.